LANSING — Nora Sintich is running out of options. She's been on the liver transplant waiting list for 14 years, her condition worsening. She can no longer eat bananas, peanuts or pineapples. She uses a walker to get around. "I don't know how to read anymore. I used to be a bookkeeper — I can't add anymore," said Sintich, a slight, frail woman of 49 who labors when she speaks. "I have trouble with speech. I can't pronounce words right. 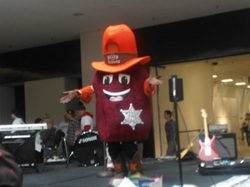 I never knew the liver was so important." Then she met a woman who encouraged her to tell her story on social media. Sintich is the opposite of tech savvy — her son equipped her with a personal Facebook page just this past December — but she decided to give it a shot anyway. Since setting up her page in January, the Lansing grandmother already has received several queries from people interested in donating (donors give a portion of their liver, which regenerates in a matter of months). While the majority were from foreigners offering to sell their livers, a practice illegal in the United States, one came from a woman in Michigan with the same blood type. As social media proliferates, people on transplant waiting lists are increasingly turning to sites like Facebook and Twitter to find living donors. Social media allows users to broadcast their stories to strangers across the world, at a time when 120,000 Americans await lifesaving transplants. Dr. Deepak Mital, director of the kidney transplant program at Advocate Christ Medical Center in Oak Lawn, said more and more people on the list at his facility have been taking to social media. He noted that all living donors have to go through a rigorous evaluation process, meeting with a social worker and psychologist, to ensure they're doing it for the right reasons. "We apply the same standards to donors who come through social media as those who came through personal contact," he said. "You have to make sure there was no coercion, no financial exchange and that this is all on the up and up." When Jim Myers, of Gary, started dialysis about five years ago, he was dismayed by all the suffering he saw around him, by the number of people unable to speak for themselves. Active in social media since the days of MySpace, Myers decided to start a Facebook page called Kidney Stories to spread awareness about kidney disease. He now administers about 30 pages for people in need of organ transplants. "I've done all the other stuff: knocked on doors, manned tables. At an event, I might reach 25 to 50 people," said the former college professor. "On social media, I'm reaching close to 100,000 people a week." It also gives himself something to do during treatment. Myers, 61, has polycystic kidney disease, a hereditary condition that causes cysts to grow on the organs. 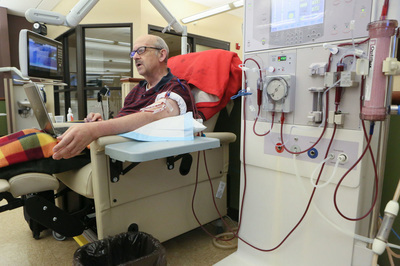 He does dialysis four times a week, for three hours at a time. On a recent day at a Dyer dialysis clinic, Myers typed at his laptop with his right hand, his left arm hooked up to blood-filled tubes leading to a machine that filtered the toxins out of his body. "This is one I opened this week," Myers said, pointing to his computer screen, his browser open to dozens of pages. "The guy's from Georgia. I've got him up to 119 likes in a couple days." Last year, Myers won the inaugural Social Media and Advocacy Award from the American Association of Kidney Patients. "I'm on three transplant lists. I have good doctors that look after me," he said. 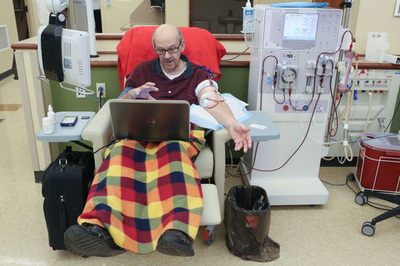 "I hope to find my own donor, but I really enjoy helping other people." Inspired by her dad receiving a liver transplant five years ago, Laurie Lee, of Cary, Ill., now tries to help others make similar connections. After meeting Sintich recently, she helped set up her Facebook page, Looking for a Liver for Nora. "Right now, with millennials, they're altruistic and looking to help people," said Lee, 35. "And those are the people on social media. There's a ton of potential." Sintich is willing to give it a try. Several of her loved ones have been tested to see if they'd be candidates, to no avail. Her condition has progressed, but not to the point where she'd move to the top of the waiting list. She has a hereditary form of cirrhosis of the liver, a disease that took the life of her sister at the age of 40. She also has hepatic encephalopathy, a decline in brain function, as well as a movement disorder. "I've spent so much time in the hospital, the nurses call me the frequent flyer," she said. But her doctors have told her her health would largely return to normal with a successful transplant. If that happens, she plans to volunteer for a Chicago-based transplant organization and her husband, Doug, intends to donate his liver to a stranger. "My grandma made it to 98. I tell my dad I'm going to beat grandma," she said. "I fight because I have two granddaughters (5 and 2). I tell my son I'll be at their college graduation." KIDNEY STORIES: WHO GETS THE KIDNEY? in order to help increase their chance of receiving a transplant. to receive a transplant than under the current system. receiving a transplant when a match is available. their body will respond to a donation with these blood types. disparities in access to kidney transplantation. 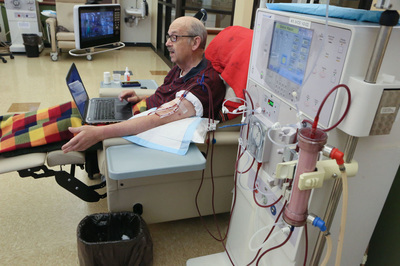 transplant or the day they began dialysis, whichever occurred first. according to the “life expectancy” of the kidney in about 20% of the kidneys. be matched with the kidneys expected to function the longest. index (KDPI) to determine how long the kidney is expected to last. diabetes status and time on dialysis. dialysis, this will allow quicker access to a kidney transplant. fairly honors the gift they made. sensitivity to receive a deceased donor transplant. than 96,000 patients on the kidney transplant waitlist. Learn more about organ donation today! donors who are evaluated but don’t ultimately donate. Create a “Living Donation Breakthrough Collaborative"
ON THE LIST WILL NOT HAVE TO WAIT MORE THAN 1 YEAR ON THE LIST! Here we post news about organ and kidney donation, organizations, medical and scientific articles, coaches, speakers, vacations, advocacy, events and inspirational photos. Browse our news page and get caught up! turning 10 in April. When Blake was born doctors had no hope of him surviving. University of Chicago. They saved his life. all this though, they still had hope. there. They watched him take off and that was it. They thought Blake was gone. They drove to the hospital in Chicago in complete silence. but Blake finally pulled through. The doctors said it was a true miracle. 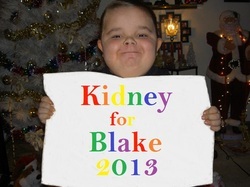 Blake was put back on dialysis and back on the kidney transplant list. Due to his age, Blake is at the top of the list. He has waited almost 8 long years now and still has not received his second kidney transplant. Blake has waited longer than any child in need of a kidney that has been treated out of the University of Chicago. There are two reasons why. The first reason is his blood type. Blake’s blood type is O positive. Anyone with that blood type can only accept forms of O blood. The second reason is because his body rejected the first kidney transplant. His antibodies shot sky high and it makes it extremely difficult for his blood to accept anything. Blake’s aunt Kylee was a match for him, but when they mixed the blood there was a bad reaction and that ruled her out. finding a match, he has suffered from many infections throughout the years. them brush their teeth, and take care of their regular night time rituals. one day he won’t keep smiling about everything. We need his smile”(Kelly Ray). always need special care and love. He is a miracle. little man get his kidney so the rainbows do not disappear. 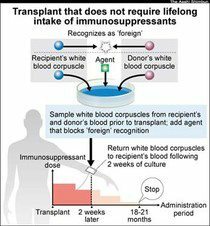 KIDNEY STORIES: NEW MEDS FOR TRANSPLANT RECIPIENTS? HOW NURSES ARE PAID AFFECTS YOUR CARE! they do affect how the advanced nurses are paid. Arizona, Michigan, Indiana, Massachusetts, and Arkansas. patients as well as how they are paid. whether NPs can be paid directly,” the authors of the study wrote.